Is it finally the year to do Valentine's Day right? 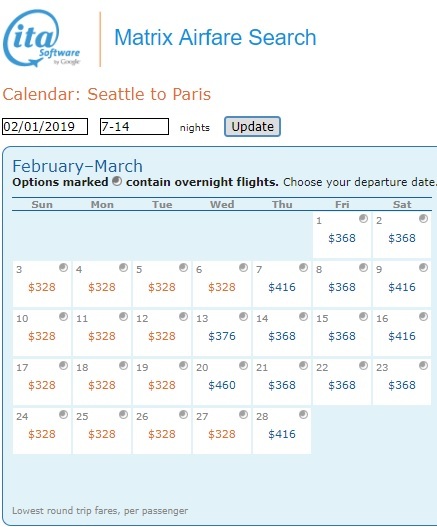 When fares from Seattle to Paris are this cheap, the answer is yes! Great deal on Iceland Air between Seattle and the city of love. Use the multi-city option to have a few day stopover in Reykjavik to hit two countries for price of one! This is Iceland Air's Economy Light which includes no checked luggage. So pack light or prepay your bag to save! Use ITA Matrix Software to find the best dates. Book through Momondo for the frugal fares! $3.49 flight? Not gonna get much cheaper than that! Aug 14 Price Drop! Seattle to Amsterdam for $302RT! Jun 3 Seattle to Dublin, Ireland for $399RT!